At its 2011 meeting, organized in Spain last September, the International Magnetic Measurement Workshop (IMMW) celebrated its 30th birthday. The retrospective presented by Louis Walckiers from CERN took a look back at the history of the great particle accelerators from the standpoint of magnetic measurement. Or, how to step back in time in order to leap into the future. A mysterious council met in La Mola near Barcelona, Spain, from September 18 to 20 of last year. According to the rare eyewitnesses, the 60 or so participants discussed issues such as “vibrating wires“, "light sources" and "magnetic spectra". Was this an occult sect? Paranormal activity? No, "it was simply the 17th meeting of the International Magnetic Measurement Workshop (IMMW), a now biennial gathering of specialists in magnetic measurement for particle accelerators", says a reassuring Louis Walckiers, a specialist in the field from CERN in Geneva. It's a discreet, dedicated community, without whom the Tevatron outside Chicago would be riddled with bugs, the construction of the LHC would never have begun and the Higgs boson would be resting in peace. "In an acceleratorParticle accelerators were developed by physicists to study the elementary nature of matter. Nowadays, they are usually immense, highly international... more than anywhere else, everything depends on very high-precision magnetic fields, intricately shaped magnets… and hence on our ability to measure them at the corresponding performance level", points out Louis Walckiers, who spoke to his colleagues assembled in La Mola about the IMMW's first 30 years. Return to the future! Los Alamos (New Mexico), 1981. The very first IMMW was attended by six people – "a few old friends who felt it was necessary to get together to talk about their specialty", explains Louis Walckiers. The arrival of superconducting magnets would revolutionize the world of accelerators. The community was mobilized to promote the construction of the Tevatron at the Fermi Laboratory outside Chicago. Two years later this would become the most powerful collider in the world, and the first to generate energy of 1 TeV. During the 1980s, the IMMW was to become THE international gathering of specialists in magnetic measurements for accelerators. 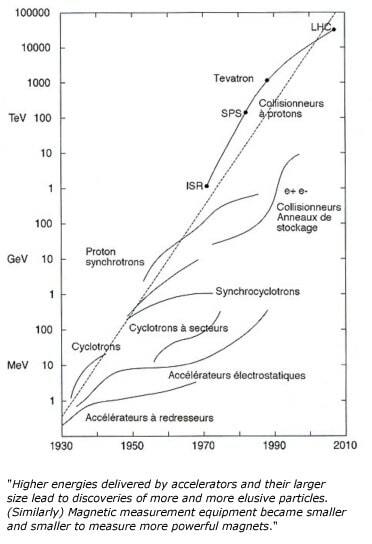 In the space of six meetings held in Los Alamos (New Mexico), Villingen (Switzerland), Brookhaven (New York) and Berkeley (California), the number of participants increased tenfold: "a similar increase to that of the energy of particle beams in accelerators", notes Louis Walckiers. The outstanding figures of the period were Alec Harvey (LANL), Branko Berkes (PSI) and Knud Henrichsen (CERN). Controversy was already raging between the proponents of analogue bucking and those of digital bucking (IMMW 1987). Already, the need to integrate the motor/angular encoder/electrical contact assembly within a revolving coil was one of the major brain-teasers. And it was to remain so: "The dream – or absolute necessity – of a fully flexible mole is still there", adds Louis Walckiers. Alas, only a few black and white photographs remain as reminders of this glorious period: "The discussions were informal, and nothing was archived", says Louis Walckiers with a smile. "In a way, it was the IMMW's prehistoric period!" In addition to the advances and questions discussed at each gathering of the IMMW, the successive meetings have enabled the small magnetic measurement community to become organized and begin to speak the same language. To take one example: "In the early 90s, workshops were devoted to adopting common definitions for certain key notions such as the reference radius of a coil, the harmonics of a field or the description of undulator magnets", explains Louis Walckiers. For the rest, the rangeThe range of a probe is defined by the minimum and maximum field strength it can measure. On an instrument,... of possibilities is largely determined – as in the past - by technological changes taking place in other fields. The idea of using multi-layer printed circuits for coils, already evoked in the 80s, was only made possible two decades later by developments in consumer electronics. Similarly, reference jigs used to position coils, which for many years were based on home-made mechanical jigs, have been replaced by new optical devices manufactured in particular by Leica. The technological breakthroughs made in the field of high-field superconducting magnets, cryogenics and vacuum technology have profoundly altered the situation. And so the story of the IMMW is entwined with the recent history of high-energy physics. In the future, the LHC may at last enable us to capture the mysterious Higgs boson. It will then need to be studied, perhaps using the particle beams at the ILC – the International Linear Collider or the CLIC – Compact Linear Collider. One day, one of these 60 km long facilities will incorporate some 50,000 magnets with 8-10 mm measurement gaps, all of which will have to be aligned with a geometric precisionPrecision is how closely multiple measurements will be clustered. Also called reproducibility or repeatability. In everyday speech, often confused with... better than a micrometre... Magnetic measurement can look forward to a bright future!